Now that looks like a relaxing place to enjoy a pint outdoors. Moriarty is not known as much of a tourist attraction for people in Albuquerque and beyond. The last time any group probably flocked there were when baseball scouts showed up to watch Matt Moore pitch for the local high school (he is now in the Tampa Bay Rays rotation, for you non-seamheads out there). Of course, Moriarty has long had its own brewery. The Sierra Blanca/Rio Grande Brewery has been out on the east side of Moriarty for many years, though it has mainly been just a production facility with a small taproom out front. Owners Rich and Sue Weber decided it was time to change all of that. Luckily for them, they had a huge area in back of the brewery that was sitting there, largely unoccupied. For several months, they have been working on creating the largest beer garden of any brewery in the state. That garden was 90-percent complete as of last week. 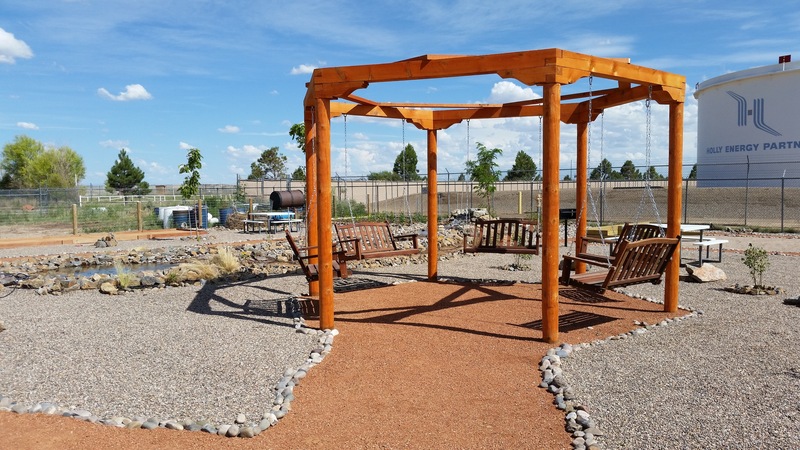 It features a running stream in the center, regulation-sized horseshoe pits in the back, a bocce ball court, a tetherball court (oh, what memories of elementary school in the 80s that thing recalls), and a whole lot more. There will be a bar out on the covered patio with its own set of dedicated taps. There is even a walk-in cooler just behind the bar, so no one in the back or the front will have to worry about someone else drinking up the supply of a certain beer. Several trees have also been planted that, as they grow, will add to the shade and the general atmosphere. 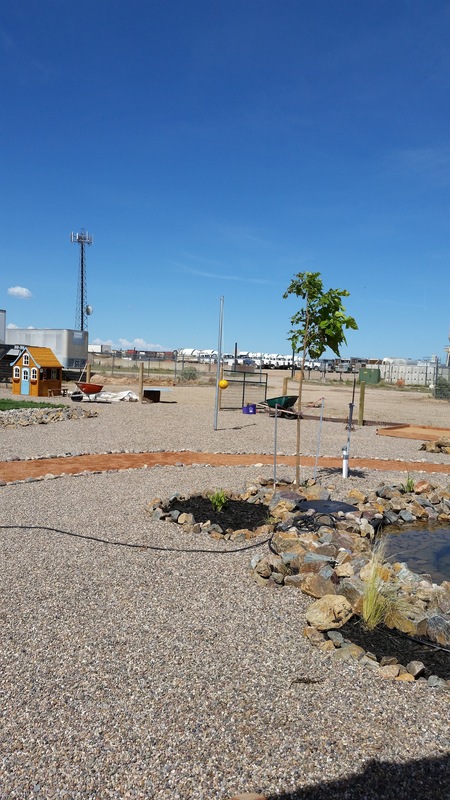 The plants will be fed via recycled water from the brewery, as well as with compost made from spent grain. 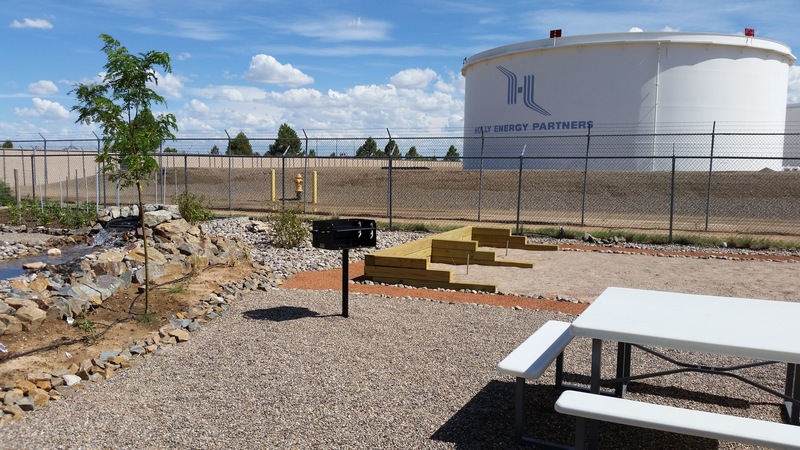 All in all, it is an environmentally sound oasis in the desert. Rich and Sue invited me to join them and take a tour, so with a pint of their limited-release Whiskey Stout in hand, I sat down to chat about the beer garden and everything else that is going on with their brewery. UPDATE: The grand opening party for the beer garden that is mentioned below has now been pushed back from Aug. 15 to Aug. 22. It will still feature live music and food trucks and will run from 2 to 8 p.m. Horseshoe pits on the right, a little stream on the left. NMDSBC: So to start with, what inspired you to do all of this? Rich: Well, part of it was the … utilizing the water and composting the barley. You can see the composters out there. Then the other part of it was more retail, less wholesale, get more people in. This place was just screaming for something like this. NMDSBC: Plenty of people drink your beer, but very few I’ve ever talked to have been here. Was that part of the idea, too? Sue: Yeah, to draw people. Every weekend we get new customers from Albuquerque. ‘Yeah, we wanted to take a drive out here.’ Now they’ll see it, bring their friends and come back. Rich: It’s in its infancy now. The trees are going to grow. You’re going to watch it turn into a green, lush place in a while. Sue: A little oasis in the desert. NMDSBC: What has the evolution been like? Have you stuck to a master plan or adapted as you went along? Rich: No, no, we started out with a set plan. We mapped it out. Last year we planted all the big trees. … We did have a hailstorm recently that did a little damage, but not too bad. We pretty much stuck right to plan as far as the layout. I don’t think we had any (big) changes. Sue: We opened the brewery in ’96. We’ve opened several restaurants, two breweries. We know about planning out and not making mistakes halfway in is essential. We created the budget, socked the money away, and when it came time to do it we got after it. Oh, tetherball, nemesis of the uncoordinated elementary school kid 30 years ago. Rich: We did the change the Pale (recipe). NMDSBC: Right, but overall you’ve picked up some momentum, especially with the market changing, all the new breweries opening. You’re kind of out here on the outside looking into Albuquerque; what’s been your impression of the (craft brewing) evolution the last few years? Rich: We like what we saw, because we started Jan. 1 to Jan. 15 this year, we (brewed) more than we did our whole first year. So we knew it was like to make beer when no was drinking microbrewed beer in New Mexico. It was pretty hard, it was pretty hard to get through the years. Most guys opening up now are selling more beer in no time flat than when we started. Everyone seems to be into it. From our standpoint, we think it’s great. We know we’re not in Albuquerque, but we have ABQ Brew Pub, we brew there all the time. We’re going to brand that with the Alien, it looks like, so that will brand it closer to us. We might get another place in Albuquerque (or) we might not. We’re kind of kicking it around. We’re going to see how (the beer garden) plays out. It’s kind of nice being out here and not in the city. Sue: Rich and I, and anyone knows us or has observed us, we kind of stick to our own little world and do our own little thing. But back to what’s going in Albuquerque, it’s always nice to see young guys and gals get together, open a place and have it be successful. That’s exciting. Most of the liquid coming out of there is good stuff. That’s important to every brewer in the state. Rich: I don’t think it’s going to be the same as it was in the old days. You’re not going to survive long with lesser stuff. Now I think they’re going to disappear quick. There’s too much good stuff out there for anyone to tolerate anything that’s not up to status quo. Sue: And the customer demands a lot more than they used to. 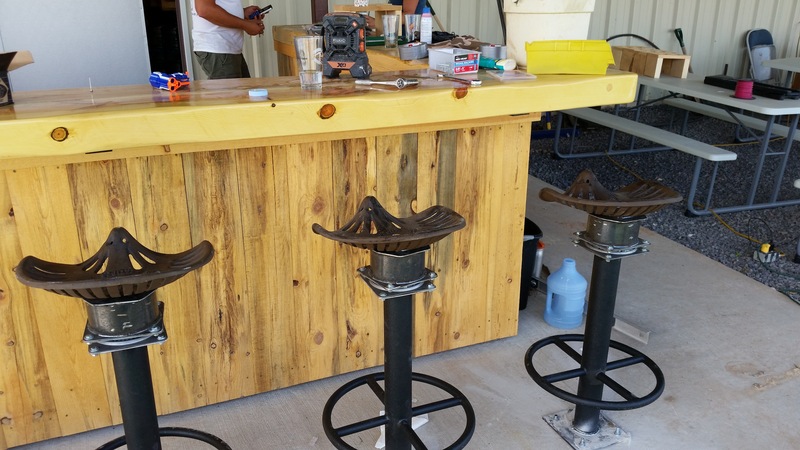 The patio bar was nearing completion last week. NMDSBC: I think the palates of everyone has changed. I used to be only a stouts and porters guy, mostly darker, maltier beers. When I first came here and drank IPAs, I couldn’t always get through them. My first IPA Challenge was rough. Now I can enjoy all styles of beers, even the big, resinous, Simcoe-heavy IPAs. But those are starting to change as well. Now we’re seeing more malt in the IPAs, like we have with Scale Tipper at Bosque. Do you get the sense there’s a constant evolution in terms of what’s being made and what people are drinking? Rich: Oh, yeah. Everyone is shooting for that new, crazy, OK, let’s do it. We’re doing a cherry sour now over at ABQ Brew, because we want to branch out a little bit and do some crazy stuff. And then we were reading about the guys doing the yogurt ones, the Greek yogurt ones. Have you heard about that? NMDSBC: No, I have not. Rich: They’ve had pretty good luck. What they’ve done is they’re taking this Greek yogurt and they’re souring the kettle water on like Friday night or Friday morning. Monday they’re coming in and brewing right into it. Sue: I don’t know if I want to try that. Rich: When I was trained on brewing, we were trained to throw those things away. Now they’re shooting for them. But I know everyone is always talking about different styles, what’s going to be the next up-and-comer. We’re going to have 17 beers on tap that we make. We’re up against a lot more than most breweries are in the state. Everyone asks why don’t you do more seasonals? Well, we do four or five seasonals, plus we do 17 regular beers. No one else comes close to doing 17 regular beers. We’re going to have 17 beers and a root beer on tap that we also make. We’ve been doing it 20 years. I always say we make a lot more of the English sessions, that was what I was trained on. I definitely specialize in the browns and ambers, things like that. We revamped our pilsner this year. 100 percent German malt. 100 percent German hops — well, not quite 100, we do use a little bit of Czech hops. And the German yeast. We’re trying to put a couple more beers into style. It’s going good. Ben (Cougar) is having a blast brewing, he’s doing a lot more brewing than I am right now. Because I kind of came out here and took this on. NMDSBC: That’s happening at a lot of the bigger breweries with the original brewers. Jeff at La Cumbre and Ted at Marble, both are taking on more administrative duties. Ted is almost never in the brewery anymore. Rich: Yeah, I’m not going to do that. I’m going to stay a micro. We’re not going to go (big). We opened a micro to be a micro. I’m not going to forget that. I’ve got two boys, when they hit (the right) age, if they want to take it over and bring it to the next level, they can do it. I have no interest in being a regional brewery. I always say there’s two kinds of beer that are good, fresh and free. 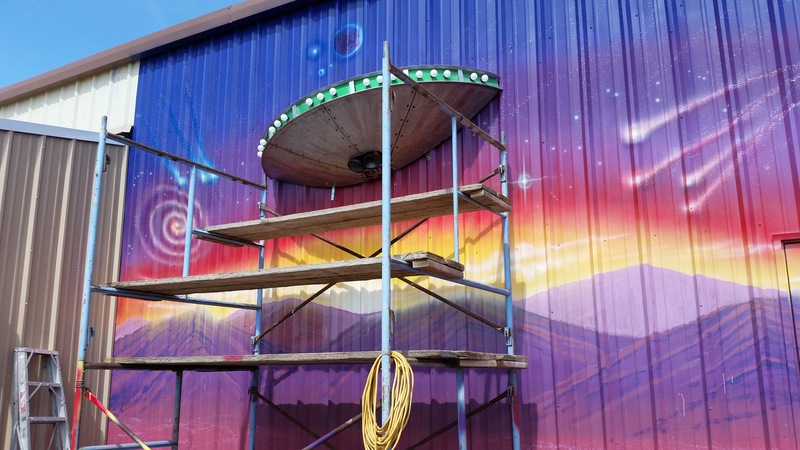 The popular alien theme will even be seen on the walls near the beer garden. NMDSBC: So there are no further out-of-state distribution plans? Rich: We’re outside the state, we do a little in Oklahoma, a little in Las Vegas, Nevada, just because we like to go there. (Laughs) We do Arizona, a little bit in Louisiana, just Shreveport. And just a small market in Texas, San Antonio and a couple other counties around it. We may look at Colorado. I don’t know if we’re going to have the capacity. NMDSBC: Colorado is so crowded, anyway. Rich: It’s actually nice because it’s a bordering state. From a shipping standpoint, we have a channel up there. Sue: We have a lot of customers up there. They’re always asking when we’re going to ship it up there, they’re tired of going to Farmington. Rich: A lot of alien people. They love the alien. NMDSBC: So back to the beer garden. You said you’re 90 percent done. When do you expect to have it finished out here? Sue: We’re going to have our big, public grand opening on the (22nd) of August. We’re going to have food trucks and four bands. It’s going to go from 2 to 8 (p.m.). Rich: It’s going to be sponsored by 94 Rock. It’s the 94 Rock Summer Bash. Sue: So bands all day, food trucks, just a lot of fun. Bring the kids, bring everybody. NMDSBC: Anything else you’d like to add? Rich: Our pub in Ruidoso is just crushing it. It’s just home run central. We owned it and sold it and got it back five years later. Sue: And then gutted it and rebuilt it. Rich: We made a list of all the headaches we had the first time and eliminated all those headaches. It was the smartest thing we ever did. It just played out well. Sue: We (re)opened a year-and-a-half ago, the majority of our staff is still there. Which is a huge testament, especially in the restaurant industry. Rich: It’s been nominated for restaurant of the year. … My brother is our executive chef. We rotate our beers through. We have 10 handles on the wall and four drafts. Sue: But back to the fun stuff we’re doing, the Whiskey Stout, the sour, stuff we haven’t delved into in the past, the restaurant drove a lot of that because the number one question with the locals was always what’s new, what’s different. Rich: And the Milk Stout, I love the Milk Stout. NMDSBC: The first time I had that was at WinterBrew. Really enjoyed it. Rich: It’s been a blast for us doing this. I remember Jeff (Erway) came out here when I was building something, I think I was doing the silo. He came out here for a meeting and goes I thought you were an idiot for opening up out here but you’re actually the smartest one. He says nobody bothers you out here, do they? He’s right, nobody does. If I want to do something, I do it. I don’t have inspectors and bureaucrats, I don’t have all that crazy stuff. A big thanks to Rich and Sue for the hospitality, and the pint, of course. Their brewery might be a bit off the beaten path, but they are certainly doing their best to make it worth the trip. The beer garden will make for an excellent destination when you want to get a little bit out of town, but still want to make sure you are somewhere with quality craft on tap. So head on out to the grand opening party on Aug. 15. Just try not to smack anyone senseless with that tetherball.